Victor Go is a Ukrainian rock musician, composer and multi-instrumentalist who enjoys experimenting with many styles and sounds. He started his progressive music career as a guitar player in the Odessa-based, art-rock band Putnik, with Vladimir Gorashchenko, (Modern Rock Ensemble), and C. George in the 1980s. Since then Victor has concentrated his efforts on studio work and collaborated with cellist and keyboardist C. George as art-rock duo Agenda (later renamed Ayesway). Together they created soundtracks for several movies and provided sound production for FM radio stations. 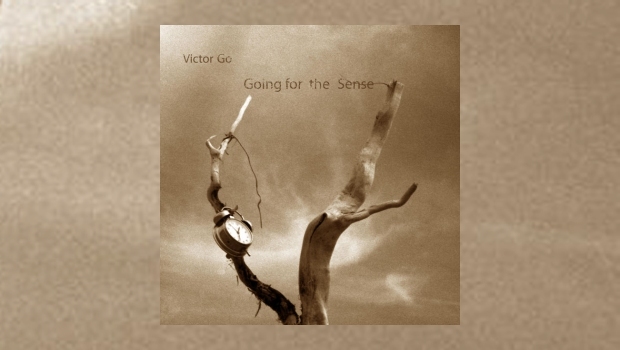 All the instrumental and vocal parts of Going for the Sense were performed by Victor Go, with the exception of some keyboard and cello parts by C. George on the last three tracks. Most of this album is keyboard driven, which makes it an easy favourite, as I must confess, although I love guitar, keyboards are my favourite instrument. In fact every track on this album is full of keyboards, guitars and music that should definitely be heard by a much wider audience, the reason I felt compelled to review this album to try and help give it the exposure it deserves. On Going for the Sense you can hear the power of that Yes guitar sound, set well against the keyboard sound you might associate with IQ. Go’s voice sounds like Paul Menel at the beginning, but later there are elements of Chris Squire and the guitar work throughout will take you back to Squire and Steve Howe from Yes. This is one of those projects where caring artists spend most of their lives cataloguing sounds and music they wish to play and hear, only releasing the results when they feel it is as perfect as it can get. Imagine a singer with that great vocal combination of Squire and Menel, singing to Yes symphonies; well that is Victor Go. Most of the music on Going for the Sense is progressive rock, but the album also contains elements of hard-rock, symphonic, psychedelic, fusion, electronic, cinematic and pop-rock. From the opening title track to the final song The Amazon, every track is filled with wonderful keyboard experimentation and intrigue. Lost in Ocean is full of synthesizers and keyboards from start to finish and the opening held me spellbound. It is so wonderful to hear all that Emerson/Wakeman level keyboard work in one song and the deep oceanic sounds along with those Bond-like strings provides so much for the imagination to appreciate. Cannot Reach Altitude however opens with more exotic keys, a 1980s powerhouse, and then Go joins in singing. His Ukrainian accent is a little more pronounced here, but it does not take away from the music in any way, in fact it adds to the variety of sound. Power guitar intercedes perfectly with those keys to give the soundscape more power. Frightening Dream is full of cinematic sound, which builds with powerful orchestration before those wonderful keyboards take over, whereas Follow Your Heart could have made it on to Yes’ Big Generator. The bold drums, lyrics, guitar and keys reflect that era of Yes so well, a second cousin to Shoot High Aim Low. Percussion and sound effects open Branches and Roots before Giorgio Moroder-like keys join in. Layers and layers of keyboards wash over you like waves. What a wonderful effect. I haven’t felt that since Larry Fast and Synergy. One of the albums’ best tracks, it’s full of what keyboard lovers want to hear. Diligence opens with acoustic guitar, a nice surprise after the electronics of the last song. Go sounds much like Paul Menel on this song, with a tinge of Trevor Horn. Buggles’ sounds and rhythms echoing with those deep electric guitars and keyboards. Stream is hard to compare to anyone else’s sound, it’s original and full of powerful lyrics urging the listener to make the most out of life, Go singing, “Don’t surrender… become a waterfall”. In contrast, Lost in Desert opens with sharp and distant drums, becoming increasingly heavier and referencing African rhythms at times. Simply amazing. Oriental sounds and first-rate percussion are mixed well with woodwinds and keys, making this track breathtaking in its cinematography and one of the best tracks on the album. Changing the mood, Eventide is jazzy. I’d liken it to some of IQ’s Nomzamo album, with similar kinds of percussion and drumming set to fast running bass, lead electric guitar and keys. Across the rest of the album we have Pretty Faces which opens with deep electric guitar riffs, smart keys, powerful drums and bass fills, a fast-paced song full of life. Romanza, in contrast, has a soft opening keyboard melody, well-placed after the preceding power track. Belled keys, piano, and string orchestration feature before acoustic guitar is added, something you might hear from Steve Hackett, only more romantic. The added flute brings in comparisons to Jethro Tull and Hackett’s brother John. Wonderful, and another of the great tracks here. The Hackett comparison continues during The Only Road along with hints of Eddie Jobson. Like Stream, Elation is another of the songs on that defy categorisation; there’s some Yes, ELP, but it’s all original in its own right, whilst the theremin–like sounds and guitars are astounding. A gigantic instrumental of orchestral proportions. The Only Road Afterthought is full of more interesting and deeper keyboard rhythms and orchestration, rounding the album off is The Amazon which has the hallmarks of a Keith Emerson masterpiece. Every note will take you back to late ELP. Absolutely a fantastic voyage through the Amazon, full of some of the album’s best keyboards. I urge you to check this album out and give Victor Go the opportunity to amaze you. If you are a keyboard enthusiast, you should enjoy every moment of this. Progressive rockers buy this, sit back with headphones and enjoy!